Located high in the majestic sun drenched foothills of Montecito is Villa Santa Lucia, an approximate 19.5 acre estate property that offers the quintessential Santa Barbara lifestyle in a setting of unmatched beauty, privacy and sophistication. Tall gates open to a long entry drive that crosses a quiet stream, before gently climbing up the hillside past blooming roses and mature olive trees to the circular stone-paved motor court of the grand residence. The impressive façade of the home is reminiscent of many of Tuscany’s famous hilltop villages – Siena, San Gimignano and Montepulciano. 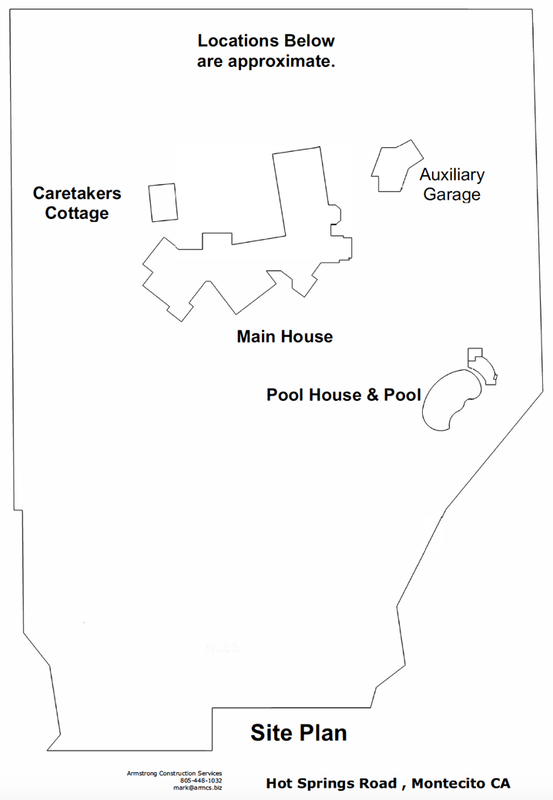 The approximate 9535 sq. ft. home was designed by noted Santa Barbara architect Barry Berkus and was completed in 1988. The immediate impression of the home is one of quality, character and old world elegance. Through the massive hand carved front door, one enters the double-story entry hall anchored by monumental stone columns that evoke the grand cathedrals of Europe. Lined with wrought iron sconces, this central hallway blends seamlessly into the living and dining rooms and serves as a unifying element to the expansive public rooms. The sunken living room with oak floors features arch top French doors that open onto a glorious terrace with stunning ocean views. An antique stone fireplace serves as the focal point for the room and the massive century old bridge beam ceiling creates an atmosphere of rustic elegance. 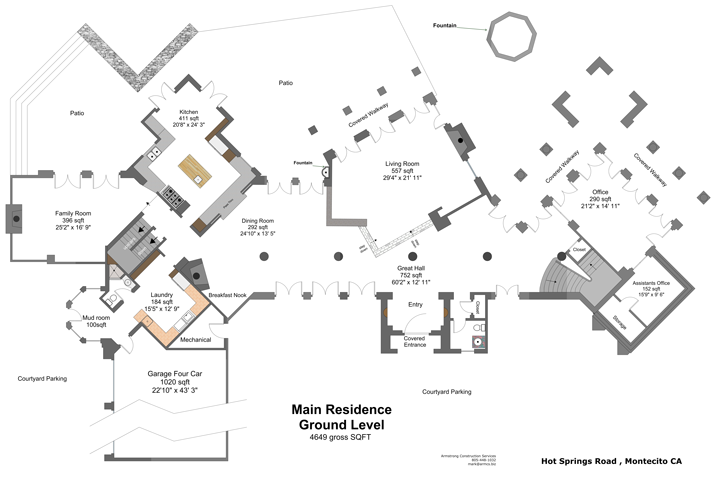 Though the floorplan for the public rooms is organic in nature, each space retains its individual character through the use of distinctive architectural detail. A low wall separates the living room from the dining area where a coffer and beam ceiling and antique terra cotta pavers give the room a sense of history and formality. French doors also open onto the spacious living room terrace. Located just beyond the dining area is a fireplace with banquette seating; an inviting corner to linger over a glass of wine and watch the last embers of an evening’s fire glow. The thoughtfully designed family kitchen features a large center island and a cheerful breakfast area that opens to a delightful shaded dining terrace. For more casual evenings, a pass-through door opens from the kitchen to service the dining area. Adjacent to the kitchen is the well- proportioned family room with a herringbone pattern brick wall and fireplace. The high cathedral ceiling imparts the charm of a small Tuscan chapel. The kitchen wing features pantry storage, a service bathroom, and an oversized laundry room fitting for a home of this scale. 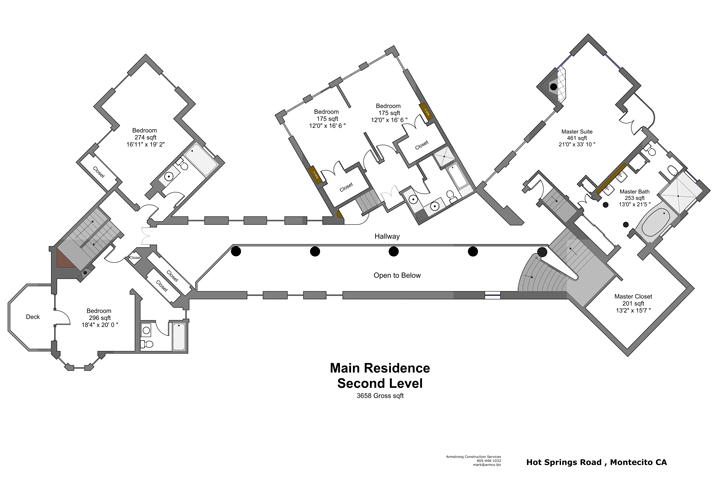 A mud room leads to the four car garage, courtyard parking and service areas. There is also a spacious basement level with a large wine cellar; electrical, mechanical and storage rooms are located here as well. As one returns the length of the grand hallway, decorative Murano glass pendant chandeliers adorned with bronze acanthus leaves bathe the antique paver floors in a warm light. The pale blue walls of a charming powder room are hand painted with climbing pink roses. A very spacious Library/Study is located at the far end of the home and features rough-sawn beams reclaimed from centuries old East Coast bridges, parquet floors and handsome built-in bookcases. With south and west facing French doors this room is imbued with a lovely natural light. An open air walkway with vaulted ceiling extends around the room – another element of European charm. Beyond the walkway is a secret hedged garden. The office also features an Assistant’s Office and large storage area. From the entry hall, a gracious staircase with oak banister and balustrade rises to the second level. Double doors painted in the Italian trompe l’oeil style open to the Master Suite vestibule. The walls of the suite are sponged a soft cream pastel. The parquet floors are laid in a herringbone pattern and Murano glass chandeliers give the room a decidedly Venetian atmosphere. An intimate sitting area is a relaxing spot to read in front of the antique limestone fireplace. A charming Romeo and Juliet balcony looks out over the oak studded hillside where tall Italian cypress trees reach for the sky. The elegant master bath is clad in a veined rose color marble and features pedestal sinks, large bath, and a shower that enjoys views up into the foothills. A fabulous, exceptionally well designed walk-in closet completes the Master Suite. A long central hallway lit by bronze wall sconces looks down over the grand hallway and leads to the three spacious, extremely private guest bedrooms. Located several steps up from the hallway is a private guest suite with a large bedroom that opens onto a lovely siting area. The tilework in the bath is in the green and magenta tones and features dual vanities, a stall shower and bathtub. The second bedroom gives the illusion of being in a tree house with its views out across the dining terrace and down to the tranquil pool setting. Here the bath is tiled in colorful shades of peach and green. 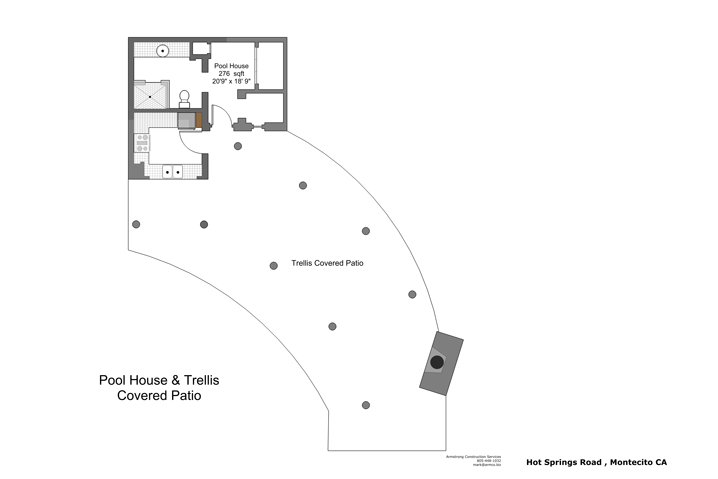 The third bedroom suite features a bay window, fireplace and delightful deck that overlooks the north facing grounds. The high ceilings and a handsome chandelier make this room a wonderful bedroom or an upstairs office. All rooms offer captivating views to the ocean or gardens. Windows along the central hallway face south and look out to the ocean over the red tile roofs so evocative of Tuscany. 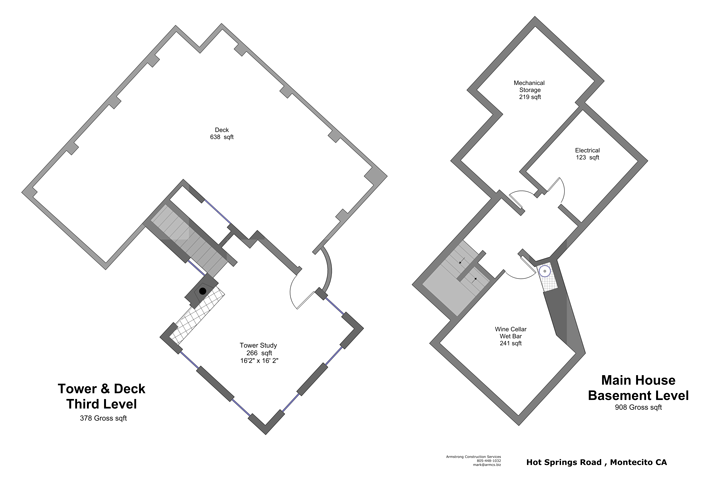 A stairwell located adjacent to the master bedroom rises to the Tower room on the third level. This unique study/meditation room features a fireplace and offers views in every direction and opens onto a magical roof deck that enjoys spectacular mountain views as well as stunning panoramas across the property to the Channel Islands and the shimmering Pacific. This sprawling deck with room for comfortable seating areas is a wondrous place to contemplate the dazzling night skies. The home is intended to replicate the stylistic evolution of a Tuscan country residence from its humble origins as an artisan’s property with rough stone walls, to that of a refined patrician villa with exceptional finish work and materials to mirror the growing prosperity of a Tuscan family. This is most noticeable in Villa Santa Lucia where simple exterior stone walls on the Family room evolve stylistically through the structure, culminating in the formal façade of the impressive living room with stone wainscot and smoothly textured stucco. The combination of rustic and refined exteriors give the home its personality and presence and bears witness to the ever changing architectural styles as Tuscan villas were added on to over many generations. The home is sited with south east facing views to capture the spectacular Santa Barbara coastline so that the terraces and patios off the living dining and kitchen areas profit from the spectacular views and vistas. Roses and lavender bloom in the shade of a giant fig tree in a garden between the living room and library which also features a low fountain. On the living room terrace, blooming roses spill out of antique pots and the large round table on the dining terrace stands in the shade of a wonderful oak and welcomes family and friends to partake in year round al-fresco dining. The inclusion of many shade trees around the home is a predominant element in Italian landscape design and to provide relief from the hot Tuscan sun. Grass covered steps with stone headers descend to the lower garden and pool area. Banks of bougainvillea, azaleas, cyanosis and rosemary combine to create a palette of color, texture and scent. Giant swaths of lawn extend to the swimming pool which is without doubt one of the most beautiful sanctuaries on the property. A natural pond shape, edged with flowering plants and large boulders is fed by a delightful stream that cascades into the pool. An elevated deck with lounge chairs affords both sun and shade. A marvelous wisteria covered trellis/loggia with outdoor fireplace is an enchanting spot for an afternoon lunch. This peaceful, tranquil setting is unique. The pool is serviced by a well-equipped kitchen as well as changing rooms and bath. Continuing down from the pool is the lower garden, where paths are lit by antique lantern lamp posts. One is invited to stroll through the oaks, olives, cypresses and fruit orchards in pursuit of the many charms of the extensive natural landscape. An approximate 770 sq. ft. attached guest cottage features its own entrance and has access from the main house under a rose covered arbor. It features a living room with skylight, galley kitchen and fireplace. 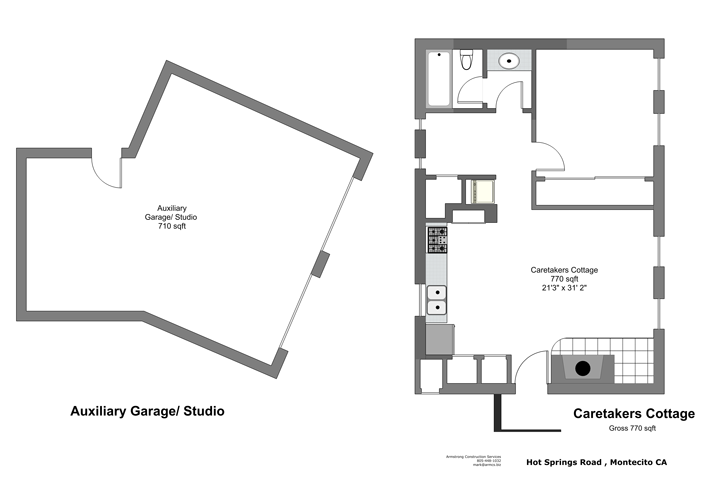 There is also a bedroom with ample closet space, bath with shower/tub and washer/dryer. Beyond the garage motor court is an approximate 710 sq. ft. home theater and music recording studio; where one can view the latest Hollywood release or jam late into the night with fellow band members. Doors to the side of the screen provide storage areas for DVDs and film and musical components. Below the studio is a rustic playhouse built by the current owner for his children. Access is by a narrow footbridge over a gentle stream. Above the main motor court with Montecito Peak as a backdrop is a terraced slope planted with grape vines. Steps climb to a long covered loggia where views of the home’s extraordinary architectural design can be appreciated. Private hiking trails continue up the hillside past giant aloes and native cyanosis. Villa Santa Lucia harkens back to the ducal grandeur of Tuscany. Tall cypress trees in the natural rolling landscape, the play of light on secluded stone terraces, the spectacular unending views to the ocean, utmost privacy, and the sophistication and regal bearing of the main residence underscore the charm, beauty and integrity of this magnificent Montecito estate. Jeff Bridges Lists His Massive Montecito Ranch for $29.5 Million—Take the Tour!